Bad Hebrew Tattoos: Which T is More Tempting? Which T is More Tempting? Yes, the diagram does not lie. There are two of them, Tet and Tav, pronounced exactly the same, yet they are not interchangeable. The tattoo above is supposed to read "Pituy" which is Hebrew for "Temptation". See that Tet in the middle, prettily decorated? Too bad the word should be written properly with a Tav. 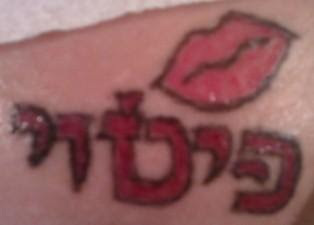 Remember kids, before getting your Hebrew tattoo make sure that your spelling is correct! That is actually pretty easy to do for a one-word tattoo. Just plug your word into any online translator. If it isn't recognized, don't ink it.